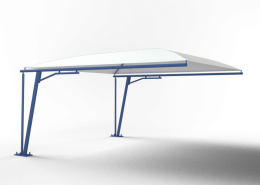 The group Europa Prefabri is a leading corporation concerning design, manufacture and assembly of metallic structures, we are specializing in the installation of parking canopies for cars or for similar uses. 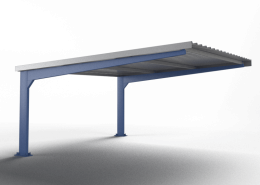 Parking canopies: canopies with a metallic structure perfect for large areas such as shopping centers, airports, train stations and public administration, and also for particulars or companies. 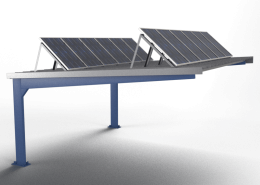 Solar parking: canopies designed especially for photovoltaic panels that can be installed on the cover of the canopy. We realize a personalized study of the project in order to offer the best structural and energy solution that can be adapted to your needs. Special canopies: we can manufacture custom-designed metallic canopies with big dimensions for various applications such as pedestrian crossings, exterior storage areas for companies, oil stations, covers for football stadiums, covers for golf courts, motorway tolls, covers for sportive installation. Our covers and metallic structures can comply with the standards recquired by the client.